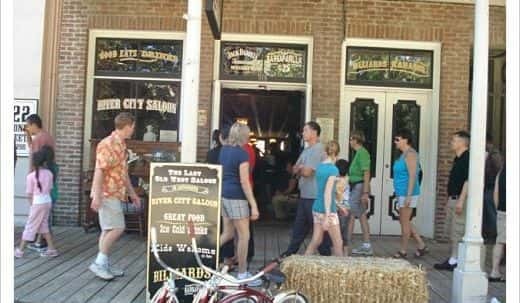 River City Saloon is located in the historic Old Sacramento district. It has had a long history in Old Sacramento. It originally was an early framed wood building that was replaced with brick in 1857. In 1861, River City Saloon was one of the original houses of ill repute owned by Johanna Heigle. 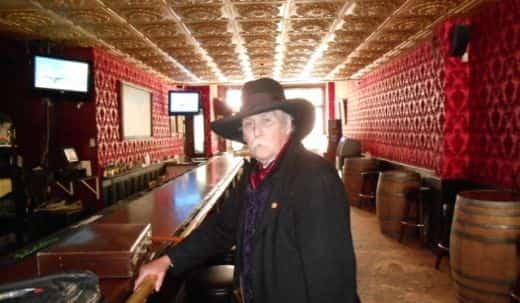 Shortly after that it became Parker French’s Saloon. It was owned by Mr. Parker French who was a colorful Old Sacramento Newspaper man that wanted a fun place to go after work. This Old Sacramento saloon was also known as an unruly place at times. Many stories of people being Shanghaied and taken out to sea have been heard. During Prohibition, it would be continually raided as it insisted it was only serving Sarsaparilla and alcohol for medicinal reasons. 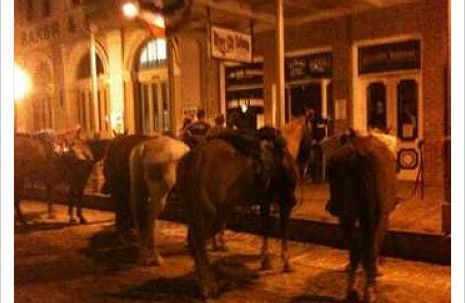 In the 1960s, Old Sacramento and the saloon had fallen to hard times as the area had become the worst skid row west of the Mississippi. 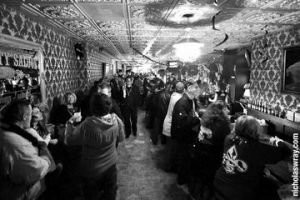 In 2007, the saloon was remodeled to its original grandeur and renamed the River City Saloon. The bar is a 1905 Triple Arch Brunswick just like the one that stood here in 1871. It was originally in a New York hotel that was demolished and then salvaged by Red Barron Antiques in Atlanta. The beautiful flocked wall paper is almost dead on for what donned the original place and the sawdust and peanut shells represent what was originally used in many saloons to keep the dirt down as many saloons had dirt floors. 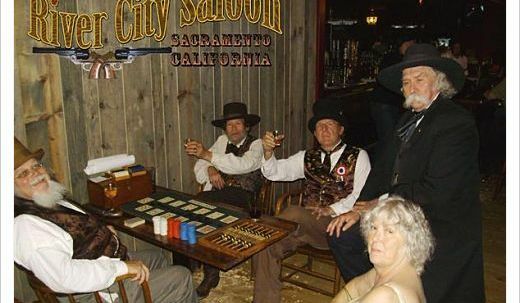 Besides the great deli style sandwiches that River City Saloon offers, we also feature Old West Sarsaparilla brewed exclusively for us by River City Brewing Company also located in Old Sacramento. In fact, you can grab the kids and belly up to the bar and get one for just 25 cents! While you’re there ask for a basket of peanuts and don’t be afraid to throw the shells on the floor. 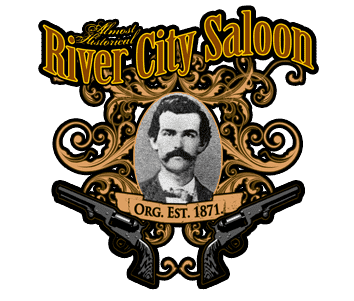 The River City Saloon in Old Sacramento also features Free wi-fi, a family priced menu of appetizers and award winning sandwiches, great video music, sports, live music, karaoke and so much more. 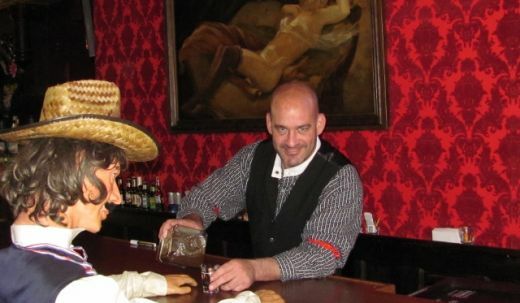 So when you’re in Old Sacramento, don’t miss Sacramento’s last old west saloon, The River City Saloon. We Serve food all the way till closing and hope to see you soon. Open 7 days a week and 21 and over after 9pm with Free Pool on Wednesday nights, Live Music on Thursdays, and Karaoke on Friday and Saturday Nights.